I have written several blog entries about hiking, an activity that my wife and I so enjoy and one that I am missing terribly since I broke my ankle last month. I have also written about some of our favorite places to hike, which are often located in areas that offer distant vistas, most particularly mountains and valleys. Truly one of the most spectacular places we have hiked is in Phoenix, Arizona, the city where my wife lived for nineteen years, before we met. She has told me about how, when she lived in the area, she regularly drove to the Phoenix Mountains Preserve to hike the trails on over 6,000 acres of land owned by the city and managed by the Phoenix Mountains Preservation Council. The network of trails in the Preserve winds up through small mountains and hills that reach about 2,000 feet above the desert floor and about 3,000 feet above sea level. These elevations, combined with the mostly treeless landscape, provide hikers with incredible views of the enormous valley below and the vast sprawl of the metropolitan city and suburbs. I traveled to Arizona for the first time in 2008 with my wife, and while we were there, she took me to the Preserve. We hiked up one of the hills, not to the top but far enough to take some great photos that I have used on occasion as computer wallpaper, like the one above. Somehow the mountains in the distance look so much higher than they are because they soar up from the flat, desert floor. There is a very definite contrast between earth and sky in many portions of the west, and this is one of those places. The diversity of plant life in the desert is far greater than most people who have not seen it can imagine. The terrain is rocky and sandy but not too difficult to maneuver. 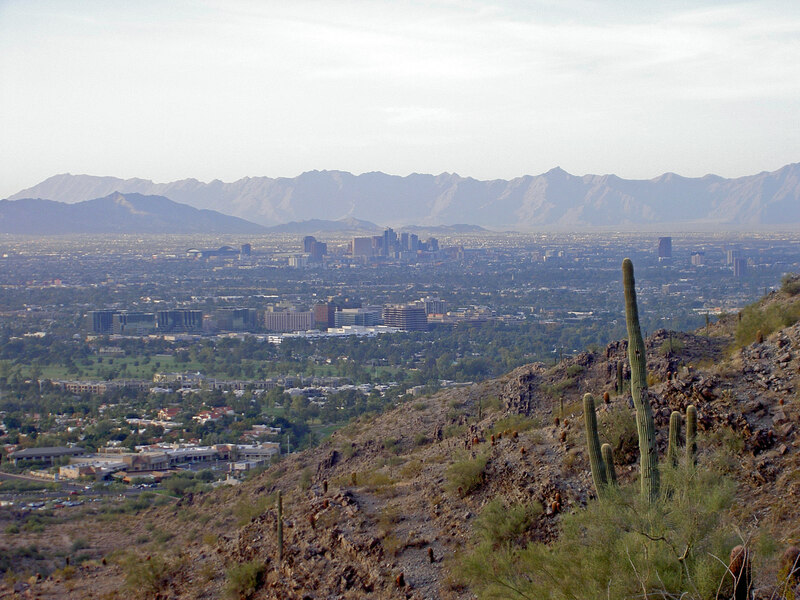 The Preserve is well used and a wonderful recreational asset for the people of Phoenix. Four years ago, my wife and I took my younger son and a girlfriend for a short trip to New York City for spring break. Although my wife had been to the city before, for the rest of us it was the first time. New York is iconic and so over the top. I can’t imagine any first-time visitor not being impressed, or at least astounded. Of course, we hit several of the top tourist sites, such as the Statue of Liberty and Times Square, but we also took in the major stores on Madison Avenue and Fifth Avenue. We even made a few small purchases just for the bragging rights. Oddly enough, the most beautiful and stunning site I saw on the trip was not one of the traditional NYC landmarks but was inside Macy’s Department Store. The Flower Show, with its elaborate gardens and beautiful arrangements, has been a Macy’s spring tradition for the past 41 years. Every available space was like an oasis of color and foliage. Plants were all arranged on the tops of display cases, tucked into shelves, and scattered on counters throughout the entire store. Corners were transformed into mini gardens. 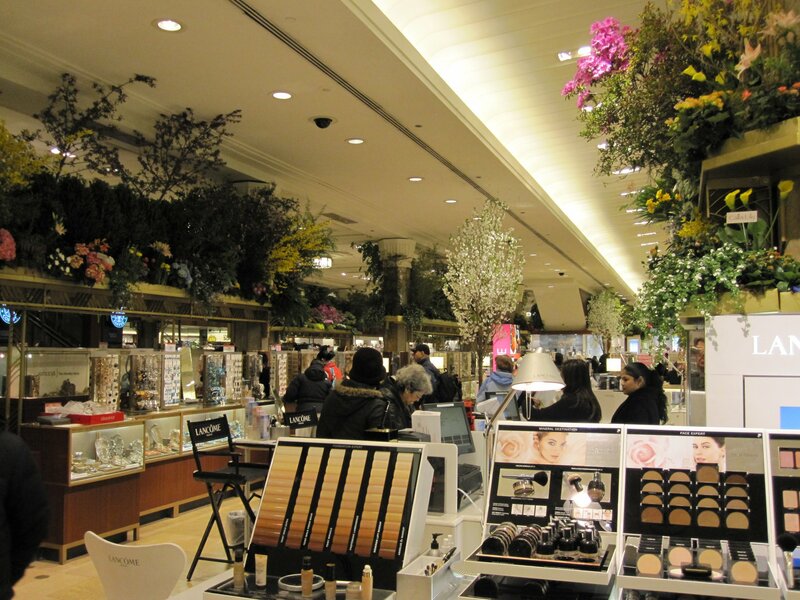 There were exotic plants from around the world, and Macy’s brings in some of the top arrangers to put it all together. It is a spectacular event that I highly recommend. As I was wandering around from one department to the next, I kept imagining how much work it would take to pull off something like this show. The set up must go on for days, and the clean up afterwards has to be a nightmare. Macy’s has a special page on their website devoted to the annual event, which includes a fascinating time-lapse video of the installation of the show. It’s truly amazing to watch. Facebook is a remarkable virtual place for people to share an almost infinite array of information about themselves, their families, their friends, their activities, opinions, wishes, hopes, dreams, beliefs, fears, faith, political views . . . the list is almost endless. However, if we are looking for a balanced snapshot of how the world is “supposed to be,” or if we’re even expecting accuracy as far as news and information is concerned, we really need to look elsewhere (and good luck finding those ANYWHERE). In that respect, the most we can hope for with Facebook is the flavor of the day — the issue or story that has captured the imagination of a lot of people for a brief moment. This week it may be a dead lion, last week it may have been the death of a jailed black woman, the week before that it may have been photos from a spacecraft leaving the solar system, and before that it may have been Planned Parenthood, and before that it may have been a battle flag from a lost war a long time ago. A year ago, Facebook was filled with folks pouring ice and water on their heads as a fundraising challenge. Five years ago it was all about the World Cup. I think we just have to take Facebook for what it really is: the dominant social media platform on the planet (I suppose) — sometimes a landfill, but sometimes a treasure chest. And those of us who have Facebook profiles can never lose sight of the fact that the advertisers are Facebook’s customers — we are the product. 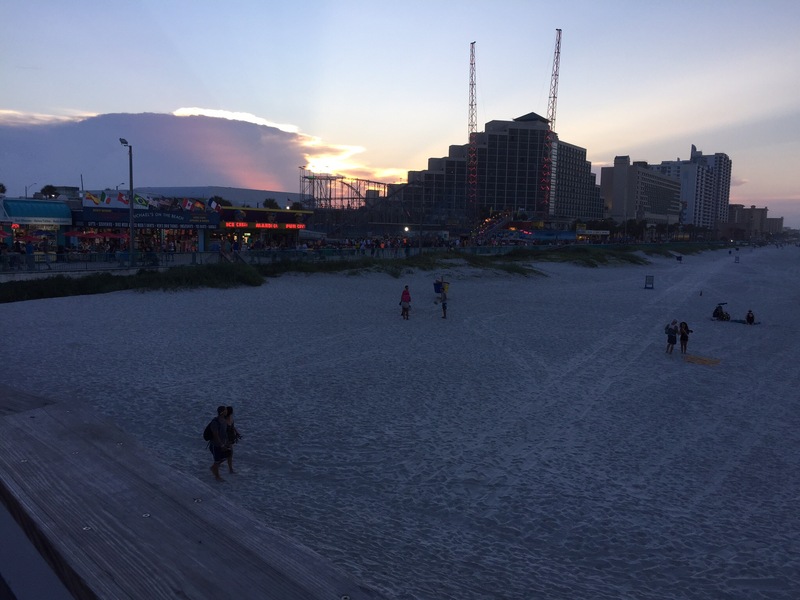 Several months back I wrote an entry about my memories of vacations at Daytona Beach, Florida. I wondered if going back now, in my mid-fifties with my second wife and no kiddies, would provide me with some sense of nostalgia about vacations past. Oddly enough, an opportunity came out of the blue a few weeks ago for my wife and me to take a long weekend trip to Daytona. We are fortunate enough at this stage of our lives to be able to afford better accommodations than I could ever have enjoyed in previous decades. There aren’t any real five-star resorts in Daytona, but there are a few four-star places that are a cut above the rest, and we found a nice one at the small beach community on the south end of the area called Daytona Shores. In fact, the resort is simply called The Shores, and it was surprisingly comfortable if not luxurious, with several amenities you wouldn’t find elsewhere in Daytona. My wife had never been to this beach, and she was curious to see my old haunts — the places I have told her about over the years. Some of the places, like the old apartments and hotels my family stayed in through the years, are no longer there. They are either replaced by other buildings or remain vacant lots ready for development. I was wondering if the highly-commercial, dare I say cheesy, atmosphere of Daytona was going to be over the top for her. Not at all. She loved it, and we were talking the whole time we were there about how to make long weekend trips work, returning to The Shores. The Boardwalk at Daytona has changed so much over the years, with an outdoor mall, new and extravagant rides, and huge hotels towering over the beach. However, some of the old arcades that my sons spent many hours and dollars in are still there, dirty and hot and smelly as ever. And of course, the ancient bandshell is still intact, where we heard a couple of bands playing. A real blast from the past was going in the salt water taffy store that has been in operation at the same location since before my wife and I were born. We filled up a plastic bag of taffy and both bought an ice cream cone — it was like tasting memories. On our family trip this summer to Yellowstone National Park, my wife found great accommodations for us at Headwaters Lodge at Flag Ranch. 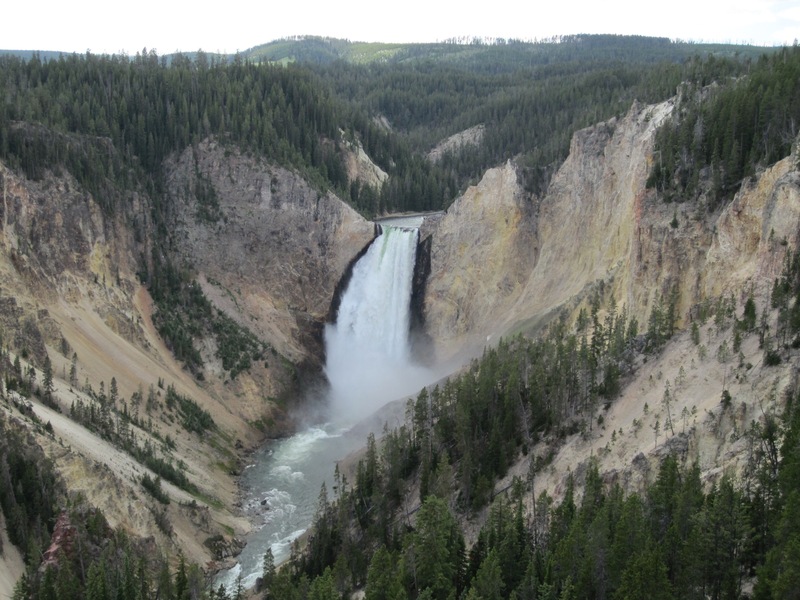 It is conveniently located just a few miles from the southern entrance to the park, providing easy access to Yellowstone and to Grand Tetons National Park. The cabins we stayed in were comfortable enough, but not luxurious in the least. They were not equipped with AC, which in the evening was no problem. We could open the windows, and the temperatures dropped significantly overnight. There were no televisions or radios, and there was absolutely no cell service or wifi access. The park literature made it clear that this kind of “disconnection” was somewhat deliberate, making it possible for visitors to appreciate the natural resources without electronic distractions. Our campground was in quite a remote area between the two national parks, so we really weren’t surprised that we would have no cell service or wifi. The lodge claimed to have wifi access, but we were never able to connect. What was a bit surprising was the lack of cell service throughout the parks. The only time we had a decent signal was at two or three of the major attractions, such as Old Faithful Lodge, or at a few of the stores and restaurants. It took a day or so to get used to the idea of this kind of isolation, but the adjustment finally came, for me at least. The other functions of our devices worked, of course, and I was grateful to have the capability of taking photos with my phone, mainly as a backup for my small Cannon point-and-shoot. Not being able to get calls from my other son back home or other family members was a little unsettling, I must admit. I wouldn’t want to be that out of reach for weeks at a time, but for a few days, it was okay to be really away from so many of the elements of civilization. I suspect the parks will eventually find it necessary to expand their cell service and even the wifi access, not only for park personnel, but also for vendors and visitors. Doing so will no doubt change the experience of being in these wilderness sanctuaries for most visitors, and that is a bit unfortunate. Being immersed in the sights, sounds, and smells of the outdoors is certainly hindered by our gadgets, and having an opportunity to explore the wonders of nature without them definitely enhanced the encounter for me. A month has passed since my last entry, but I have a few good excuses. My wife and I did some traveling in July, and my workload at the office increased a bit too. Even so, I would have made an entry by the last week of the month had it not been for a significant event on July 19 that brought me to a brief standstill — a broken ankle. This is the first time I have ever broken a bone, and I wasn’t prepared for how the pain, though not necessarily acute, would linger for several weeks. I am fortunate in that it was a single fracture and apparently not bad enough to require surgery (at least not so far), but I have been in a cast for two weeks and have had to get around either on crutches or with this snazzy four-wheel contraption with a bench for my knee that allows me to scoot around pushing off with the good leg. Those who have read this blog know that mobility is extremely important to me. I love to travel, I spend lots of time walking and hiking, and my job even requires me to be outdoors on a fairly regular basis. Furthermore, I am a gardener and love growing and caring for plants in our yard and maintaining the lawn. In fact, I was spraying deer and rabbit repellent in the front yard when the accident occurred. I really wish I had a better story for how I crashed to the ground, but wet grass, a steep slope, and the wrong kind of shoes were a deadly combination that sent me crawling back to the front door, where my dear wife helped me in and iced my ankle immediately. The swelling began very quickly but was not widespread and there was very little bruising. It could have been much worse. A trip to the clinic the next evening for X-rays confirmed that I had a fracture. I’m sure the modern style of cast that I am sporting, the bright-colored fiberglass wrap, is infinitely better than the old plaster casts of years ago. Still, the weight of the cast is probably as much a source of discomfort as the fracture itself. My calf tends to swell, along with my ankle, inside the cast if I don’t keep the leg elevated most of the time, a condition that ranges from being uncomfortable to painful. The depressing part of the whole dilemma is that I have to keep weight off the ankle for up to six weeks. I will probably transition from the cast to a lace-up boot pretty soon, which will probably be more comfortable, but I will remain very limited in my mobility for several more weeks. I’m having a hard time adjusting, but knowing that the situation is temporary also invokes a sense of guilt. How ridiculous for me to complain about this inconvenience when there are so many people who have to make these kinds of adjustments, and a whole lot more, for the rest of their lives. What will I take away from this event that has disrupted my routines for a few weeks? Well, for starters, I will give more consideration to the type of shoes I wear, especially while strolling around the yard. I will probably be more aware of the terrain and surfaces where I walk regardless of what I may be doing at the time. I want to be more careful without being too fearful. I certainly hope I will be more sympathetic to people with disabilities who struggle with everyday tasks and movements about which I normally would not give a second thought. I will be forever grateful to my wife, my youngest son who was home for the summer, and many others who have been so gracious, considerate, patient, and helpful in getting me around and who are assisting me in getting back on both of my feet. I am thankful for a fantastic orthopedic surgeon, one of the best doctors I have ever met, whose skill, knowledge, and bedside manner have given me a great deal of assurance. Lastly, I suspect for the rest of my life I will be reminded of how fragile we are and how quickly a freak accident can take us from being fully functional to a piling heap on the ground.